Decimort's handy integration of overdrive, lo-fi and filter effects make it good value for money, and the sound is spot on. Very reasonably priced. More authentic than typical bitcrushers. Preamp is useful in its own right. Built-in filters. Easy to use. Decimort is designed as a high-quality alternative to lo-fi effects such as Cubase's BitCrusher, Logic's Bitcrusher, and Live's Redux. Pedants will scoff that the 'bit crusher' tag often associated with such digital lo-fi effects isn't too accurate, unless you consider crushing to be the same thing as reduction. More notably, it's not just the bit-depth that's tinkered with - the sample rate can be lowered too, a process known as decimation. The sample rate determines how many times a second a signal is digitally recorded - ie, sampled. The number of available digital volume levels that are used to describe each sample is dictated by the bit depth. Lowering the bit depth means that fewer values are available to represent the vertical position of each sample, leading to a 'stepped' waveform - the samples are quantised to a vertical grid. At moderate values, this adds a grungy hiss, but at extreme settings, the wave becomes very distorted. Though on the face of it these phenomena are undesirable, a little lo-fi can add some funky grit to a sound. Old school samplers from the 1980s were only able to sample at lower rates, giving many productions of the day a crunchy quality that today's technology doesn't impart, and many are keen to recreate such sounds. 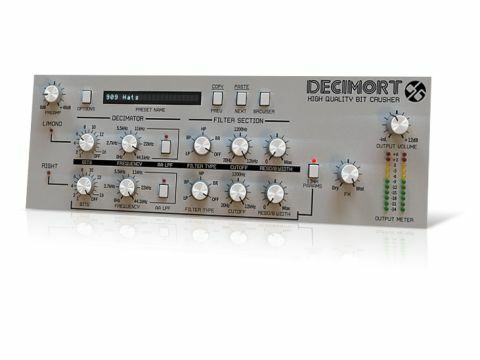 Unlike the crude algorithms used in, say, Cubase and Live's bitcrushers, Decimort emulates how the circuitry inside analogue-to-digital and digital-to-analogue converters actually works. D16 tells us that, amongst other things, Decimort interpolates the incoming wave to reconstruct a more 'analogue' version, then applies noise to mimic the natural dither caused by circuitry. The result is a grittier tone, without the harsh (sometimes constant) 'fizzing' artefacts of lesser crushers, albeit at the expense of higher CPU usage. Decimort really does sound like crusty old digital gear, though whether you actually think this is 'better' is a matter of taste. Control-wise, at Decimort's heart are the bit-depth and sample-rate reduction knobs, which range from 1 to 16 bits (or Off), and 0 to 44.1kHz respectively. Decimort can process left and right channels independently or together, and there's also an anti-aliasing filter. Each channel also has a more conventional, tweakable multimode resonant filter with low-pass, high-pass, band-pass and band reject controls. These might not be anything out of the ordinary, but they have a quality sound. Finally, there's a simple Preamp knob for overdriving the incoming sound. This is a useful effect in its own right and assists in further approximating the tones of old-school hardware. Speaking of which, the presets feature several patches based on classic bits of kit, including Akai's MPC60 and E-MU's SP-1200 samplers. Decimort isn't groundbreaking, but it does give you very high-quality overdrive, lo-fi and filter effects in a single effect.